The ongoing goal of many professional stone fabricators is to try to reduce the number of steps in the stone polishing sequence. Additionally, increasing the number of stone types has the potential to make a polishing pad more effective. 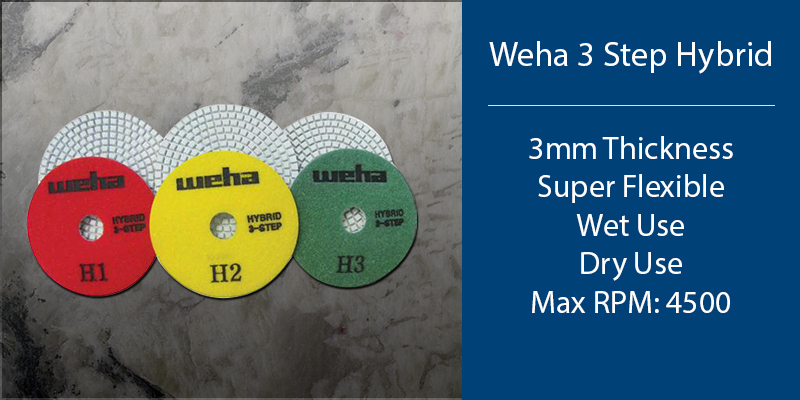 The 3 Step Hybrid polishing pads from Weha aim to be a big step toward the coveted spot atop the polishing pad hill. As a general rule, most fabricators seeking to reduce the number of polishing steps love the idea of only 3 steps. Even if they must make a few more passes during each step it is worth it. Going from the standard seven step process to a three means less than half the steps needed. The 3 Step Hybrid polishing pad system is designed to give fabricators the highest quality polish – in three steps! The key to the effectiveness of a polishing pad system for natural stone involves a lot. Many factors affect the true value and efficiency. Two such factors are quality and compatibility. These 3 step polishing pads tout a high quality polish with a deep luster. To get that kind of result, the quality has to be high. When Weha set out to develop these pads, price was the last criterion on the list. The quality of polish is high too; in both wet and dry environments. Testing this 3 step system in fabrication shops has proven to stun fabricators that simply did not believe such a good polish achievable with a 3 step pad. Although a pad works well on a specific kind of stone, another important factor is the number of stones it works well on. Let’s talk about stone compatibility. Stone compatibility is another major aspect of how well polishing system performs. The more stone types the system work with, the less tool set up that is needed. This high quality 3 step system offers great results on a variety of materials. Marble, granite, engineered stone and others are compatible with the 3 Step Hybrid polishing system. These pads won’t be the lowest priced pads you find, but they are sure to give you more for your money than other options. And, who can resist trying to reduce the polishing process from 7 steps to 3?